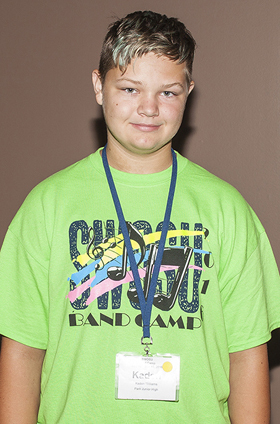 Kaden Williams, a student at Park Junior High School, was among 501 band members from five states to attend Southwestern Oklahoma State University’s 61st annual band camp July 10-15 on the school’s Weatherford, Okla., campus. Camp director Marc Mueller said the students auditioned for placement in one of six concert bands and participated in rehearsals and a variety of recreational activities. The camp culminated in a final concert featuring all six bands.